August | 2014 | Let Teddy Win! 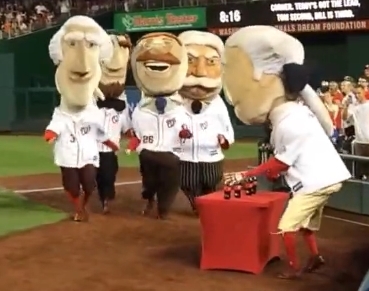 Nationals racing president George Washington jumped onto the “Share a Coke” bandwagon Friday night at Nationals Park, setting up a table with personalized Coca Cola bottles for each of his fellow racing presidents near the finish line of the fourth inning race. The shameless plug distracted George’s competitors, who each stopped to get their drinks as the founding father dashed off toward the finish line to take his second straight victory. 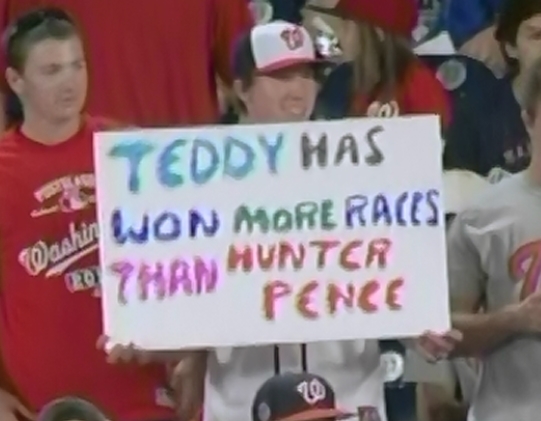 The game was the first of a weekend series vs. the San Franciso Giants, prompting one fan to compare the Giant’s Hunter Pence to a certain racing president. 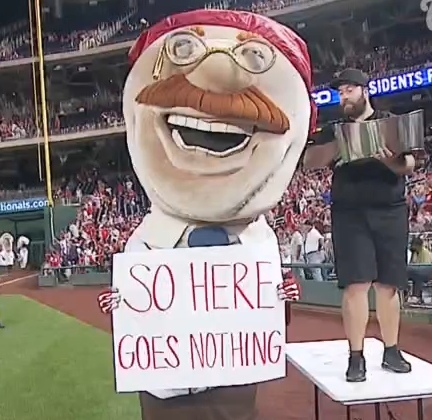 During Wednesday night’s game at Nationals Park, Teddy delivered. 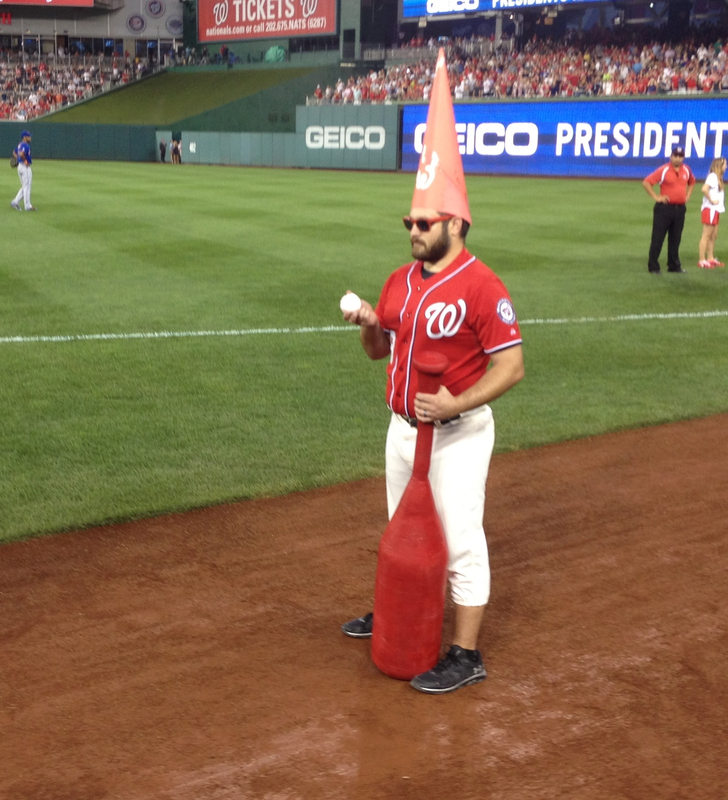 The Rough Rider jumped in front of his competitors during the fourth inning presidents race, crossed the finish line wearing a shower cap, and held up a series of signs. After accepting Czarniak’s challenge, a bucket of water was dumped on his head. 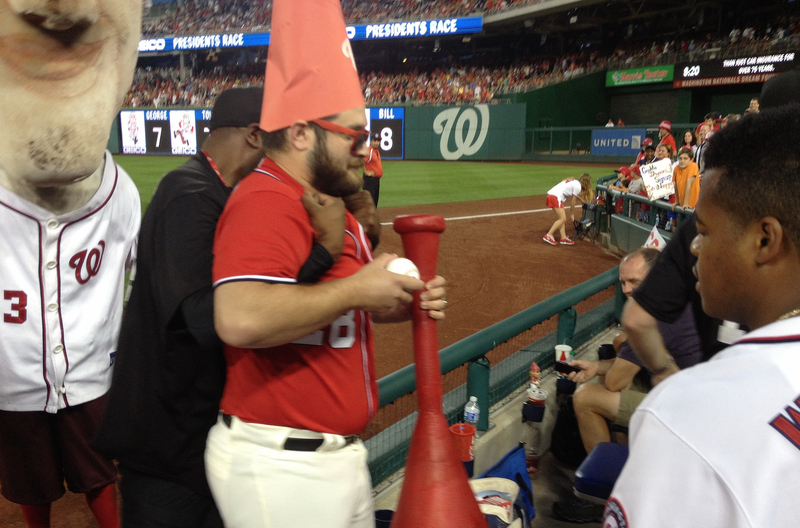 Roosevelt shook off the cold shower, then issued challenges of his own to WWE wrestler El Torito, Nationals principal owner Mark Lerner, and NASCAR driver Kurt Busch. Here’s a GIF of the action, plus Czarniak’s original challenge, as well as the full race video as seen on Nats HD. 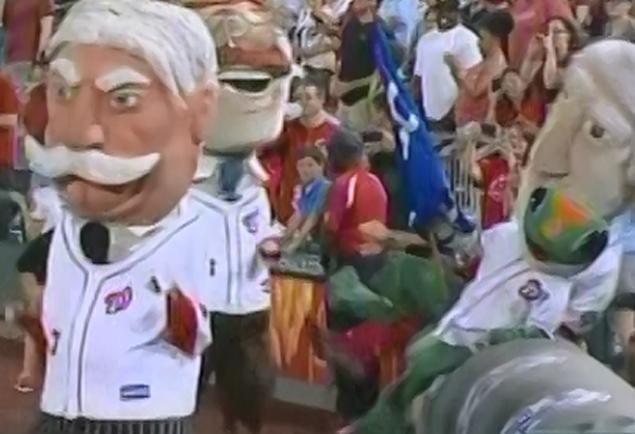 It’s hard to say what got the Rushmore Four riled up Tuesday night, but after watching fellow racing president William Howard Taft cross the finish line at Nationals Park, the Nats’ remaining racing presidents decided to gang up on the GEICO Gecko. 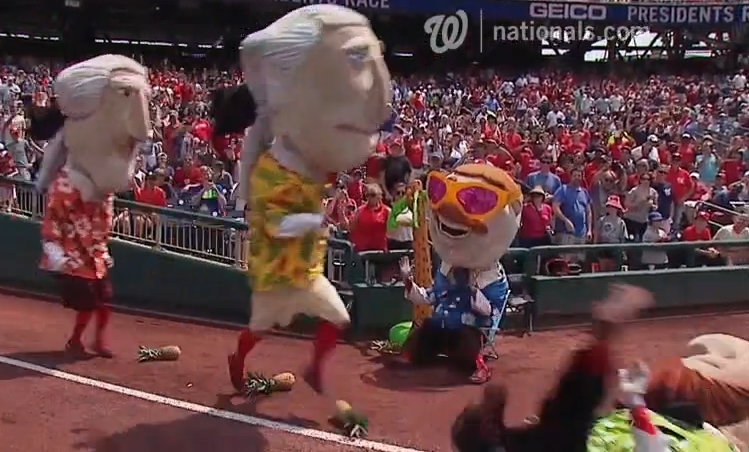 The sponsor, who helps out at the finish line nightly, is usually off limits to the presidents’ antics, but immediately after Tuesday’s race, Thomas Jefferson pushed the amphibian insurance salesman into the Grounds Crew’s tarp in foul territory. 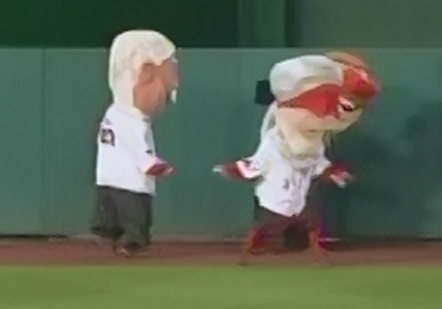 The slippery mascot evaded Jefferson, who got stuck behind the tarp, but then Teddy Roosevelt charged at him, followed by George Washington, who grabbed the lizard and jumped on top of him. Perhaps they didn’t save as much as they’d expected on their car insurance. It was a beautiful day to play hooky from work, and Teddy Roosevelt took advantage. For Thursday’s afternoon game at Nationals Park, The Rough Rider parked himself in a Hawaiian shirt in a lawn chair, sunning himself along the first base line. 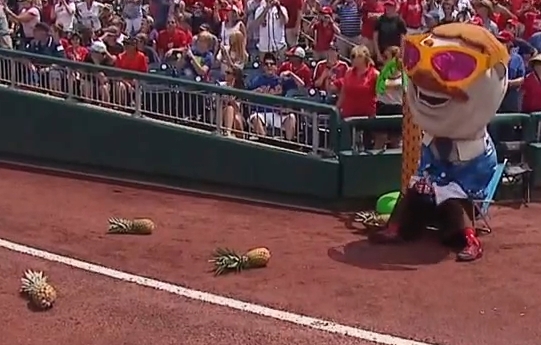 As his fellow presidents were forced through an obstacle course of palm trees on the warning track, Teddy scattered pineapples on the ground in foul territory. 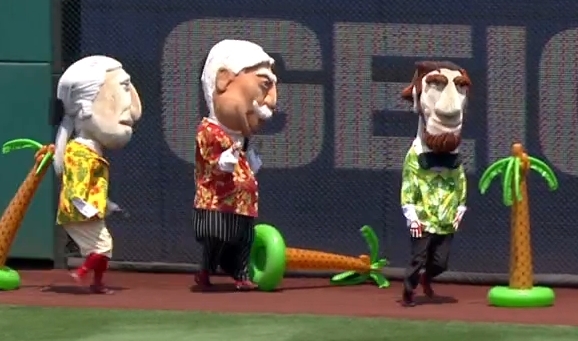 As the presidents approached the home stretch, Abe, George, and Tom tripped on the pineapples. Taft got through the obstacles, but Teddy got up and threw a pineapple at him from behind, knocking the Big Chief to the ground. 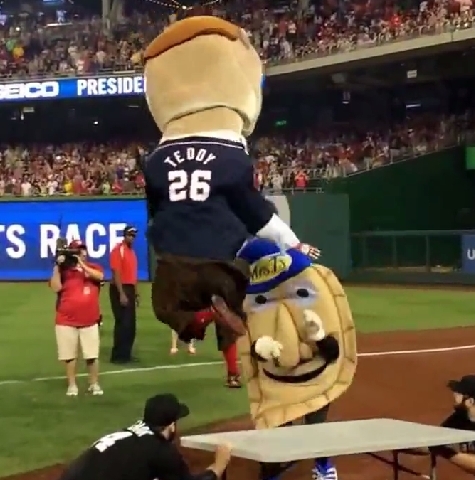 The victory pushes Teddy further into uncharted territory, in first place by 5 races as the Nats head to Atlanta.